Google CEO Eric Schmidt gave the tech world a sneak preview of the successor to the Google Nexus One handset today, while confirming that the Android 2.3 OS it runs off will be rolled-out within weeks. Schmidt was speaking at the Web 2.0 summit in San Francisco, where he held up a phone he described simply as an "unannounced product" running Android 2.3 Gingerbread. We still don't know who makes it, but it looks very much like some of the recent mobile offerings from Samsung. There's still not much more to tell about the front-line specs or release date, but the guys over at Engadget did track down Schmidt to get a brief walk-through and some hands-on photos. 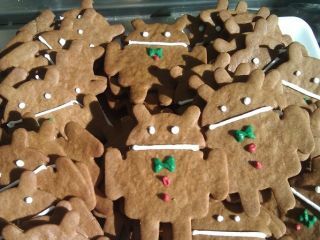 The Google chief also confirmed that Android 2.3 will be called Gingerbread and is but a few weeks away from release. The hottest new feature appears to be support for handsets with NFC tech, which Schmidt says "could replace credit cards" with users bumping their handset against a reader to pay for goods. Another cool Android 2.3 feature confirmed today? Check out the new 'screen off' animation.